This summer I found the book I believe I’ve been waiting for all my career: The Art of Coaching: Effective Strategies for School Transformation by Elena Aguilar. (San Francisco: Jossey-Bass 2013). Let me try to explain why. The title of my masters thesis in Sport Psychology back in 1997 raised the question: What’s in a Coach? I was writing specifically about the dynamics of the relationship between teacher-coaches and their student-athletes and in a nutshell, I was trying to unravel the tremendous power, impact and reach of those very unique connections I experienced both as an athlete and as a coach. My fascination of and commitment to coaching only expanded and deepened in the years following. As a PE specialist, a general coaching stance has become integral to my style and method of teaching. I encourage my students to seek their own solutions to various obstacles, I raise questions which help them reflect on how to make the most of their own resources and as much as possible, I listen, observe and listen some more. Further studies in communication, leadership and facilitation continue to confirm for me both the need and efficacy of coaching in a host of educational contexts. And this is where The Art of Coaching soars above all the other resources I have encountered related to coaching in the educational sphere: Elena Aguilar says “transformation” and means it: transformation of teachers, administrators, schools, ultimately of whole systems. It’s possible to read The Art of Coaching as a how-to manual for instructional and leadership coaches in schools. Aguilar succeeds famously at taking the mystery out of the coaching process and guiding new and experienced coaches to learn, practice and apply the critical elements of the craft. Yet this book offers more. Aguilar’s fundamental commitment to the larger goal of equity in education for all students defines the context of her work at all levels. This broadening perspective lends heft to the individual actions and processes she describes. The coaching itself is not just about helping the individual teacher or administrator to improve, Aguilar sees it as vehicle for transforming schools on the systemic level. Further, as she offers coaches multiple means to connect and succeed with clients, she also champions the use of profound strategies for leaders to view and approach their challenges. Specifically she introduces 6 lenses for examining a situation from highly unique perspectives. The lenses are those of inquiry, change management, systems thinking, adult learning, systemic (or structural) oppression, and emotional intelligence. She employs rich and nuanced storytelling to demonstrate how these lenses and their respective questions can be used to take problem-solving deeper to address possible root causes. 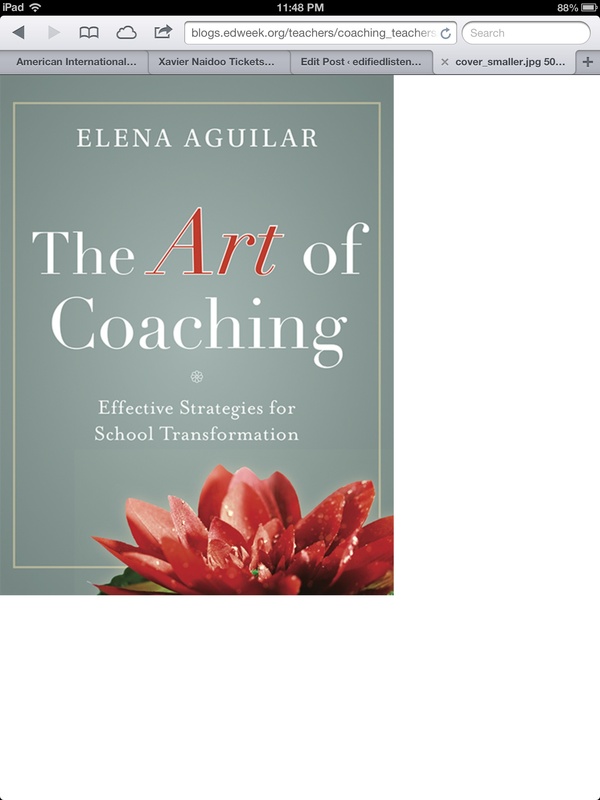 Although the book’s focus is on building coaching capacity, I would argue that in fact, Aguilar has given educators an excellent leadership book written from the coaching perspective. I am in the process of recommending the book to anyone in education and/or coaching who will listen. Through The Art of Coaching, Elena Aguilar has inspired, instructed and above all empowered me to share the unraveled mystery of what’s in a coach and what tremendous potential resides in coaching for transforming education.